However, Robert Scoble, who has been accused of sexual misconduct in the past, has so far gone unscathed. Though two women recently stepped forward, accusing Scoble of inappropriately grabbing them, both incidents happened prior to 2015, when Scoble publicly confessed that he was an alcoholic. Scoble said at the time he was getting help and going into Alcoholics Anonymous. Earlier this afternoon, in an interview with USA TODAY, Scoble apologized for his past, repeating his claims that his bad behavior occurred back when he’d had a drinking problem. Many have since dismissed Scoble’s past actions as just that — in the past. But that isn’t true, according to several women TechCrunch has spoken with. Despite Scoble’s public apologies, he has allegedly continued to drink, smoke pot and proposition women repeatedly, say two women, even after they say they told him to stop. 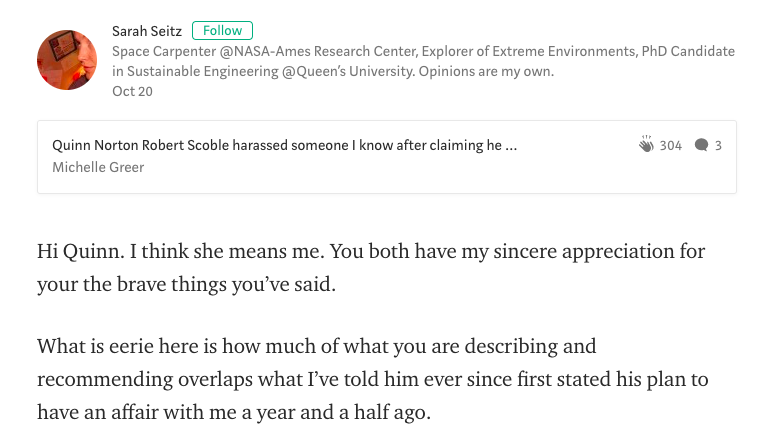 After journalist Quinn Norton recently published her Medium post accusing Scoble of grabbing her, NASA analyst Sarah Seitz said in the post’s comment section that Scoble had propositioned Seitz for an affair a year and a half ago — after he’d publicly stated that he was cleaning up his act. Seitz later told TechCrunch she’d turned Scoble down, but that he continued to pursue her anyway. Another woman who chose to remain anonymous told TechCrunch that Scoble made a pass at her, telling her how much he wanted to make out with her after getting high at a tech conference earlier this year. She said that Scoble later apologized for his behavior and lavished her with praise; he also connected her with people she needed to help further her career, which she said effectively silenced her. Scoble is in a position of power to many people in the tech industry — a point that has arisen repeatedly in our interviews with women in his sphere. His actions — both past and present — have been kept under wraps for that reason, they say. In fact, two additional women have told TechCrunch that Scoble was still making inappropriate advances after he’d publicly stated he was going sober, but neither wanted to go on record for fear of the repercussions. He’s also been helpful to both people and startups when they’ve sought out his attention. It seems unlikely that his vast network will continue to view his brand of self-involvement as quite so comical now. 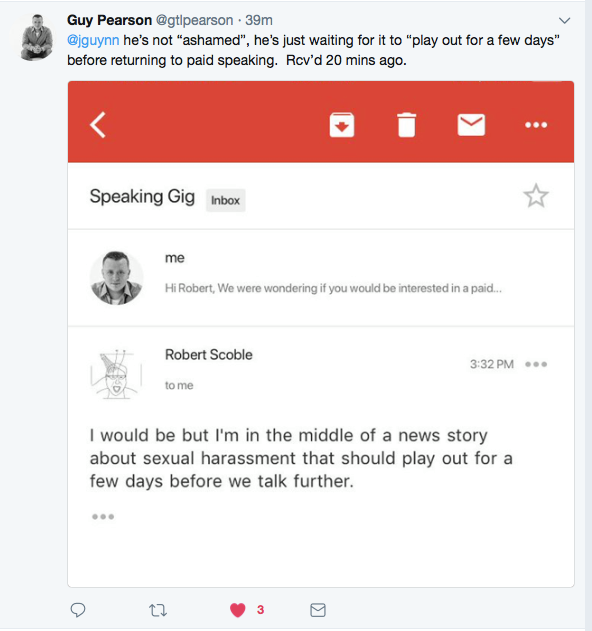 Scoble did not address these recent allegations specifically, instead committing to proving himself through future behavior. The question now is if he really means it and, further, if he is to be believed. Update: Scoble has since deleted his original apology and now posted a lengthy rebuttal to the reporting done by TechCrunch and other publications on his personal site.